Every home needs a functioning refrigerator. As technology has advanced, so have these appliances. They are more than just containers for food. They offer many options to make your life easier. That is what makes shopping for a new one so challenging. It can be very difficult to figure out which brand and model best suit your needs. This guide will help you understand more about the top LG refrigerators. You will learn about the different features and how they work, and you will get answers to common questions to help you as you shop. You can learn about the good and bad things each model offers, as well. It can help you make a more informed decision, and since refrigerators are not cheap, it also ensures you get the best for your money. ​If you have never bought a fridge before, or you haven't bought one in a while, then it can help to review some frequently asked questions. You can learn a lot about what to look for in a fridge, which can help you as you begin your buying experience. ​How does a fridge work? ​A refrigerator uses a gas to cool down the interior while a motor helps to expel heat. The insulated properties of the fridge also help to contain the cool air and keep out warm air. It is actually fairly simple. ​At what temperature should I set my fridge? ​You probably know that if you set your refrigerator's temperature too low, it uses excess energy. This can even sometimes freeze items inside that aren't meant to be frozen. Keeping the temperature too high is a health hazard and could result in bacteria growth in your food. The ideal temperature for the fridge is between 35 and 38 degrees Fahrenheit. 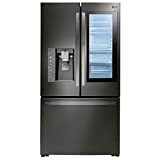 ​What styles of refrigerators are available? There are four main styles you can choose. The top-freezer style is probably the most common. It has the freezer on top with the fridge on the bottom. The next option is the bottom- freezer, which has the freezer on the bottom. It is like the top freezer, just flipped. You can also consider the side-by-side, which separates the refrigerator on one side and the freezer on the other. Finally, there is the French-door style. 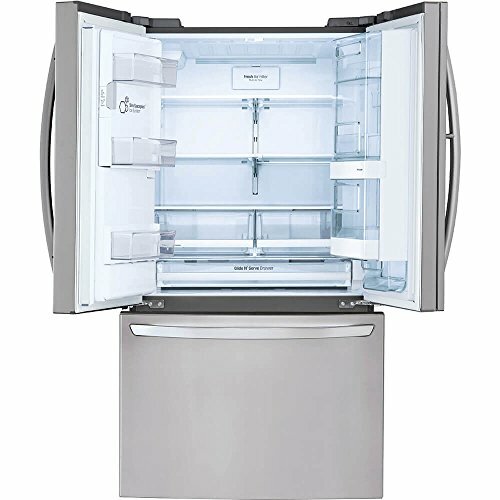 It has a freezer compartment on the bottom with the fridge on top, but the fridge doors are side-by-side style. 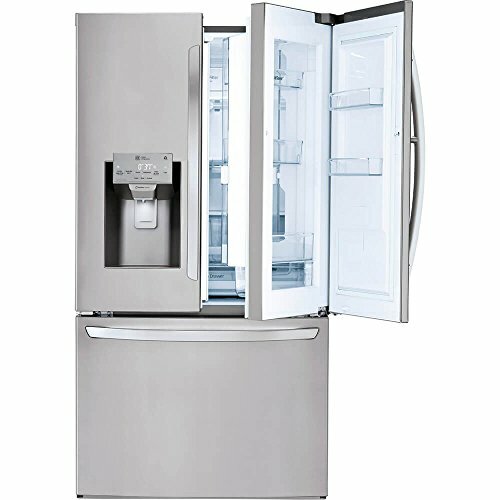 ​How big of a refrigerator do I need? When deciding what fridge size to get, you have to first consider your space. Some homes may have the fridge spot under or between cabinets, so if this is your situation, you have to make sure to measure carefully so the fridge you buy fits. You also need to think about how much space you want inside the fridge. Some styles offer more space compared to others that are the same size. Also, remember that the more space inside the fridge, the more it costs to run. However, with newer models, you usually get energy-efficient features to help cut costs compared to your old fridge. ​Do I need a water or ice dispenser? ​This is really up to you. Consider your family's needs. For example, if you mainly drink bottled water, then you probably do not need a water dispenser, especially since it raises the cost of the unit. If you have small children, then water and ice dispensers could lead to big messes, so you may want to skip them. However, if you use a lot of ice on a regular basis or want access to cold water quickly, then you may want a dispenser. You should also think about the setup. Typically, you need to be able to run a water line to the refrigerator to allow for water and ice dispensing. Depending on your kitchen, this may or may not work. 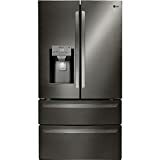 We compiled our list of the best LG refrigerators based on reviews and customer comments. We looked at features and other aspects of each fridge to determine which ones seem to offer the best experiences for consumers. We also looked over tests of the cooling systems to ensure these fridges stand up to the demands of use. We took time to go over the LG models on the market so we could bring you the very best. Our research was thorough and in-depth to provide you with comprehensive information and give you an unbiased look at each option. 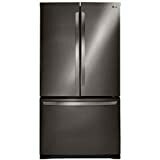 LG refrigerators can be bought at most major appliance retailers, so they are easy to find. You will find costs run from around $1300 to almost $4000. You can expect to pay more for special features, such as ice dispensers or climate-controlled shelves. Lower-priced models still have the quality expected from LG and offer some nice features, but they lack the high-tech aspects that the higher-priced models have. ​In looking over each of these models, keep in mind that prices are just general and subject to change. LG may run sales that offer hundreds of dollars off the listed price, and individual retailers may also have seasonal sales. Most models can be found at any retailer that sells appliances. 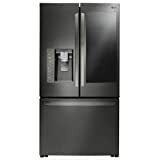 Finally, LG offers a free, non-transferrable warranty that provides limited coverage of all refrigerators. Retailers may offer additional warranties at extra cost. This fridge is stainless steel and has a sleek, modern look. It has hidden hinges in the contoured doors. The interior space measures 26.8 cubic feet. It also features an ice maker and water dispenser. The shelves are spill proof with one that folds and three that pull out. Additional storage features include three 6-gallon bins in the doors and a four-compartment crisper. This refrigerator has a stainless-steel exterior, which makes it looks modern. It features many storage bin options to help keep the interior organized. It does have set shelves, but they are placed to allow room for taller items. The glass shelves are easy to clean, and the freezer compartment is very deep, providing plenty of space. This is a large-capacity refrigerator built for big families. It has plenty of space for all the snacks, food and drinks you need for a growing household and is loaded with features. It has a Custom Chill drawer that lets you set the temperature for fast cooling of drinks and other items. The drawer also has a child lock to stop the kids from getting inside it. There is an access panel that provides access to the bins without having to open the whole door, which is a great energy-saving feature. This is a sleek fridge that is a counter-depth style with French doors. It is a popular choice because it is simple yet modern looking. It has a stainless-steel exterior with hidden-hinged, contoured doors. The spill-proof shelves are adjustable, and it also has a four-compartment crisper. This French-door refrigerator offers more space than the traditional counter-depth fridge. The four drawers and four shelves along with the seven door compartments allow for plenty of space to hold all your food items. It comes with both ice and water dispensers and uses the Smart Cooling Plus system. It also has digital controls and a Smart Pull handle. It is stainless steel for a sleek, modern look. This fridge has a counter-depth design with a modern stainless-steel exterior. It has an exterior dispenser for ice and water. It also is configured to be ADA compliant. The smartly designed interior provides plenty of space with glass shelves and bins and a four-compartment crisper. The freezer has two drawers and is lit. The ice maker is located in the refrigerator door to help free up more space in the freezer without compromising function. There is also the optional interior and exterior style package. This fridge has many design features. It is made of black stainless steel, which is quickly becoming a popular choice among consumers. It also is cabinet depth. While the exterior is rather simple, inside you will find plenty of storage room. It has a powerful Smart Cooling Plus system and also has Smart Pull handles. The ice maker is a SpacePlus design to keep it from taking up too much of the interior storage area. The spill-proof shelves help you keep it clean while the freezer section is easy to access. The black stainless steel provides a very trendy look for this fridge. It has oversized bins and spill-proof shelving. It also features ample storage space along with superior cooling and reliability. It has an exterior ice and water dispenser with different settings and quick ice-making capabilities. The double-drawer freezer allows you to more easily organize items and find them when you need them. 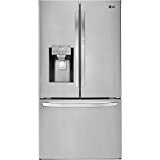 Based on our research, we can conclude that the best choice among all the top models of LG refrigerators is the LFX28968ST French-Door Refrigerator. While the price is on the high end, it does offer many great features and receives constant good reviews from consumers. The storage space is excellent, and it provides the popular French-door design.